The first consortium meeting focused on the content, methodology and aims of the market study and defined the demands and expectations of the participants. Further participants can still join the market study. It is still too early to fully utilise or even assess the enormous variety of possibilities and freedom offered by additive manufacturing in terms of part design and possible production structures. Linking up with successful product development processes is absolutely essential for this. Compared with classic product development processes, developers and designers cannot, when planning to use additive manufacturing technologies, resort to conventional material databases, testing procedures, standards and software tools. Instead, the interplay of material properties, part design and processes must be individually determined for almost every new part. The results are virtually untransferrable, and most of the existing technology and process know-how is very difficult to quantify and reuse. Increasing the product development and production efficiency is thus one of the reasons why the "IKV market and technology study on additive manufacturing" starts with product development. Within the consortium, the aim is to develop new approaches that make it possible to better utilise the potential of the production process and estimate this potential compared with possibilities offered by established processes. First of all, the IKV team will draw up an overview of the presently available tools for product development in order to assess how the tools can be adapted to additive manufacturing. At the same time, the technological possibilities and the potential of both additive and established manufacturing processes will be clustered and compared in order to enable the consortium participants to quickly evaluate the technology in its entirety. From this technology evaluation and the company-specific orientation of the consortium participants, the project team will identify future challenges and draw up solution approaches and specific work schedules for rapid implementation. Every participating company will benefit individually from the study. For each company, a roadmap will be drawn up for a product development tailored to additive manufacturing, which takes into account the individual challenges and objectives of the company. For this purpose, staff members of IKV will visit every partner in the study at his company site and hold workshops there. 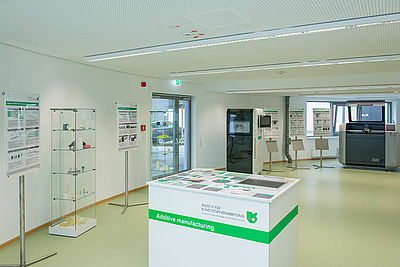 IKV is predestined to assume the role of initiator in a study of additive manufacturing. Not only is additive manufacturing one of the subjects at IKV that has its own pilot plant for testing purposes, it is also one of the lead topics that constitute the focus of research at the Institute. Last year at K 2016, IKV demonstrated its innovative strength in the field of additive manufacturing with a hybrid production cell that combines additive and subtractive processes in screw-based extrusion. The topic was received very positively indeed by the experts at the K show and has enabled significant technological optimisation to be carried out on the set-up. A team of four scientists at IKV is behind the field of additive manufacturing, and all of them are closely connected to the study. It is headed by Dr.-Ing. Suveni Kreimeier and IKV's Scientific Director, Dr. rer. nat. Rainer Dahlmann. If you are interested in participating in the market and technology study, please contact IKV. It is still possible to join the study!